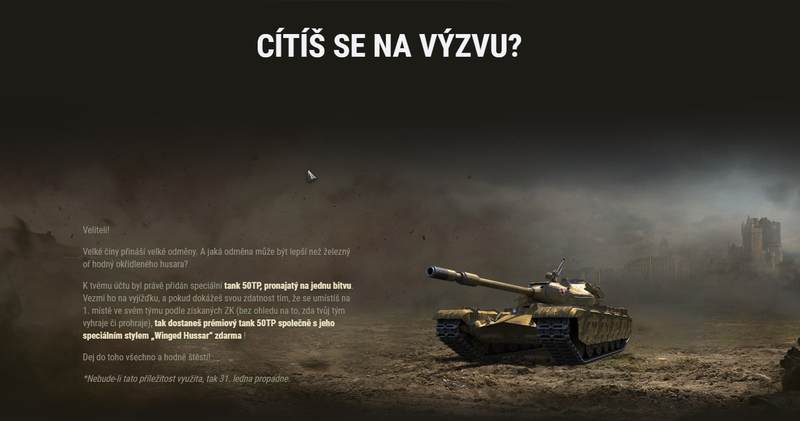 World of Tanks (EU): Free Tier VIII Premium Tanks? 9 Comments on World of Tanks (EU): Free Tier VIII Premium Tanks? From time to time, Wargaming runs quite interesting for some randomly selected players and there is one quite interesting one at the moment: be Top XP in a single battle, get a free Tier VIII Premium tank. Big thanks to Dr_inseminator, one of our readers from EU region, for sending me an email with details. Basically, some players are getting a promotion in-game, where they get a one battle rental 50TP Prototyp and are challenged to be 1st place in experience in their team. If they manage to do that, they can keep the tank for free and will also receive a Winged Hussar style for free. So if you are one of these lucky players, are you up to the challenge? Did you get the free Tier VIII Premium 50TP Prototyp in your one battle try, or did you miss the chance? Should Wargaming do more promotions like this one? Let us know in the comment section. I did get the messeges in game Combat Intelligence… But no tank in garage… After a while the messeges disapeared. What? It’s not for everyone… it’s random and it’s WG who sends the promotions to players. I was one of those lucky players and I did complete the mission, so I can confirm it is real. you only have to be number one on your own team on exp. There’s a lot of behind the scenes we don’t see. My main account gets a LOT better offers on the prem store than my second alt. I once wanted to get one of these special for acc2 and upon switching it was gone!? Switched back to 1 … It was there! Made tripple sure it wasn’t a browser thing … Nope. It was legit. PS. Those accounts might got things in common. Like..
Money spend and time (not) played in X. So like every cool free tank in the game you have to be the best player in the game to get it . So tired of being punished because im not a super Unicom.